Yes, for those of you wish to have a real train experience, I think a trip on Eurostar from London to Paris or from London to Brussels might be one that would put a whole new light on one's opinion of what train travel should be like instead of what it is today in some countries. Try London to Paris in just over two hours or London to Brussels in just under two hours instead Sydney to Melbourne in 10 hours. And yes, there appears to be a little difference in what Australia seems to be capable of in railway terms and what the European, especially the French and the Germans, have been able to achieve. 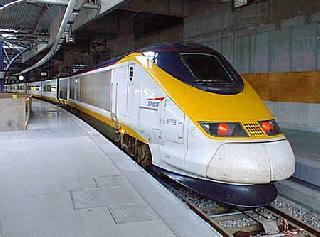 The London to Europe trips run via the HS1 high-speed rail lines to the Eurotunnel emerging at Calais to split to either Brussels or Paris via Lille. The carriages are very comfortable and at 300kph in a lot of places, watching the outside world go past is most interesting. Light meals and snacks can be purchased on board and the food served, while not cheap, is still good value. The fares structures between the three destinations compare well with airline fares and in terms of time variations, Eurostar trains are more than able to compete with airlines. While in France, travellers should try some of the many TGV high-speed trains that operate across France and throughout other parts of Europe. At 300kph, they are a lot of fun. All in all, well worth a try. Recommendations: A Eurostar or TGV trip is well recommended.